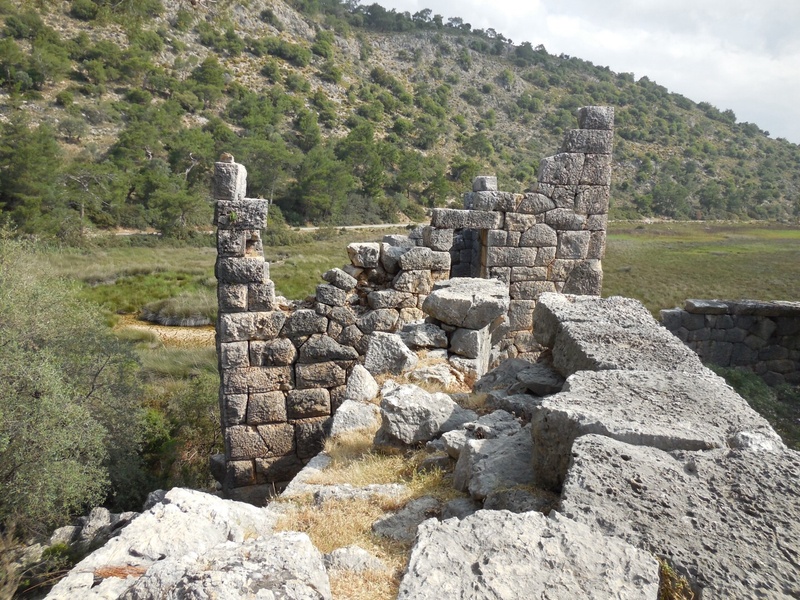 Lycian Way, Turkey. 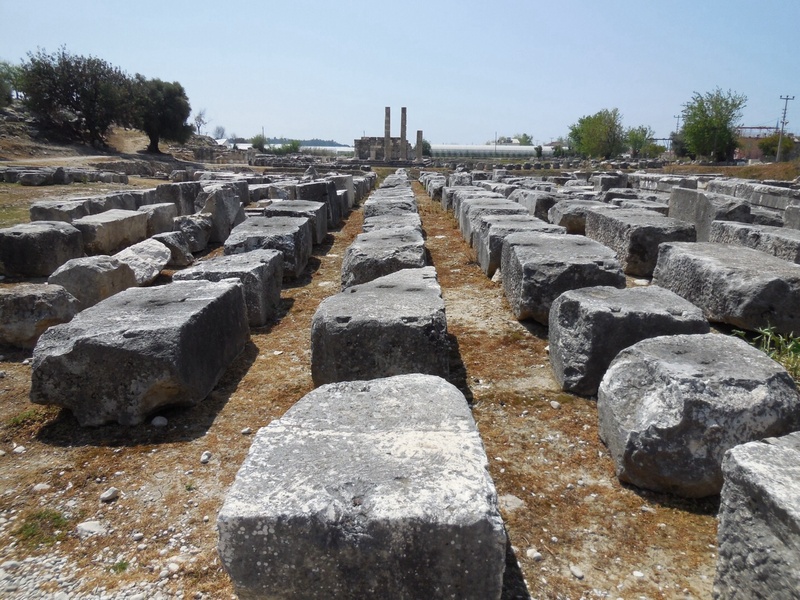 Gavuragili to Xanthos. Ali’s culinary skills shine again at breakfast. Early morning conversation is all remembrance and plans. A common theme is how completely separate one day seems from the next. Ahhhh Time and perception of it’s flow, my favorite. I chime in with my theory of ‘how the fierce continuous concentration required to ensure each footfall lands safe in difficult unknown conditions binds us fast within the confines of a perceived single temporal unit, each one separated by the slow dark fluid abyss of dreams’. Luckily I am already very used to people looking at me like I am from another world when in fact I am only from the other side of this one. Strangely enough we are not last to leave Candan Garden. Ali wishes us well at the gates and gives Pam a sweet smelling pink rose to pin to her blouse. 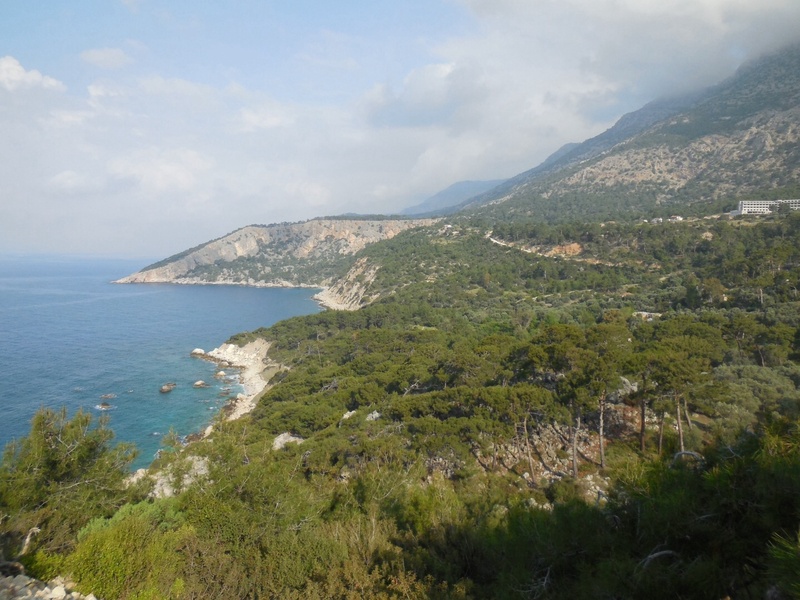 During dinner the previous night Ali had advised everyone that the Lycian Way trail has had serious land slips on the next section and recommended we all stick to the road until near Pydnai. I am all too happy to follow his recommendation, we make good time however eventually are overtaken by Howard and Judy. Personally I think part of our slow progress is my by now strong compulsion to stop and take photographs. I am comfortable with these pauses as they give Pam a chance to lift her habitual marching gaze from her shoes and actually see the territory she is marching through. 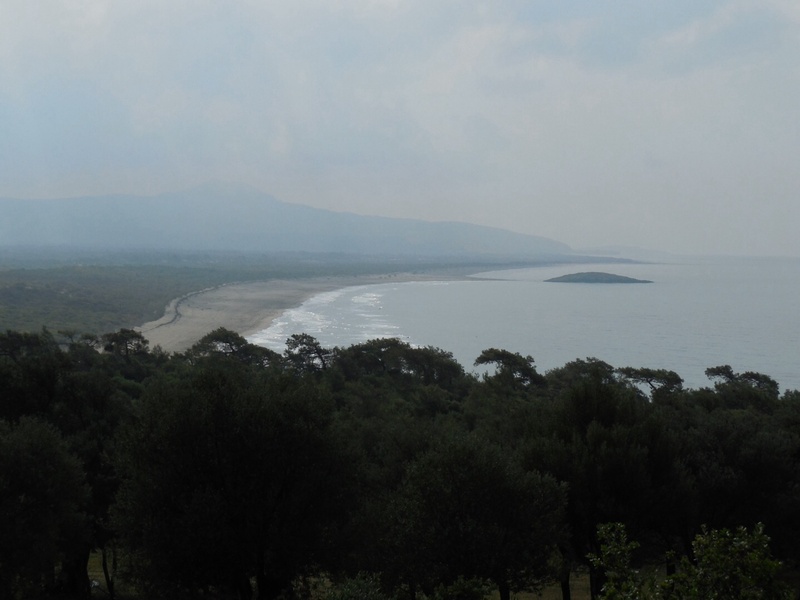 I stop frequently to try and get good shots of the headland we are passing along with the long Patara beach that we are approaching. Not far inland from the beach the ‘tomato tents’ Ali has advised catching a bus through fill the entire valley stretching out seemingly to eternity. Pam asks me to sing a marching song and I growl out Lou Reed’s ‘The Blue Mask’ with enough intensity to get hairs standing up on my arms and blood coursing through my veins. Brrrrr, now I am fully awake. 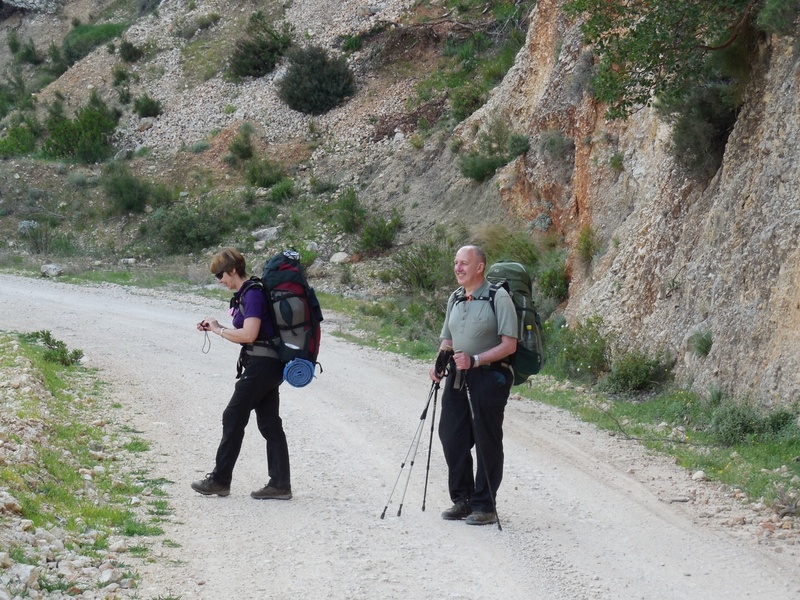 The Pilgrim’s Law of Undulation applies to roads found otherwhere than on the Camino. 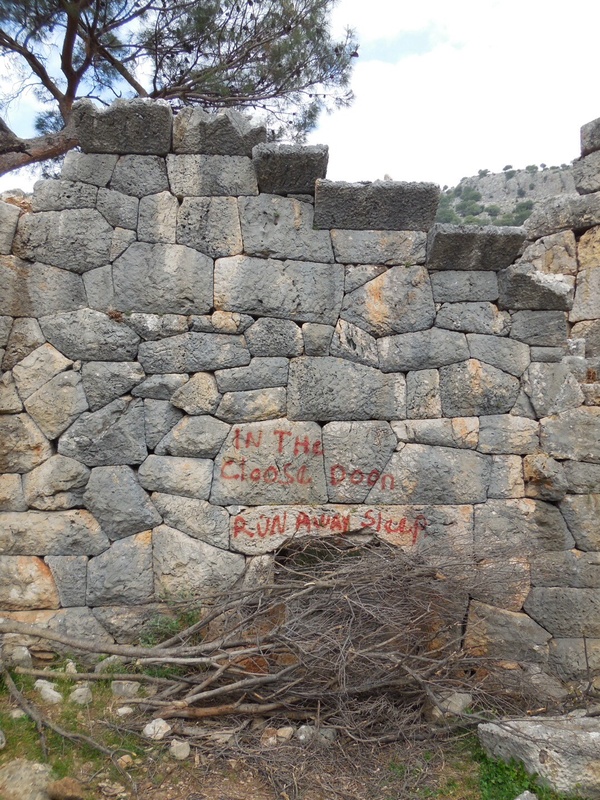 Up and down we climb until we eventually turn right from the road at a sign bearing evidence of the many spent shotgun cartridges I have seen on the trails and make our way along a relatively good track to the incredibly skillfully masoned stone walls of the ruins of Pydnai. 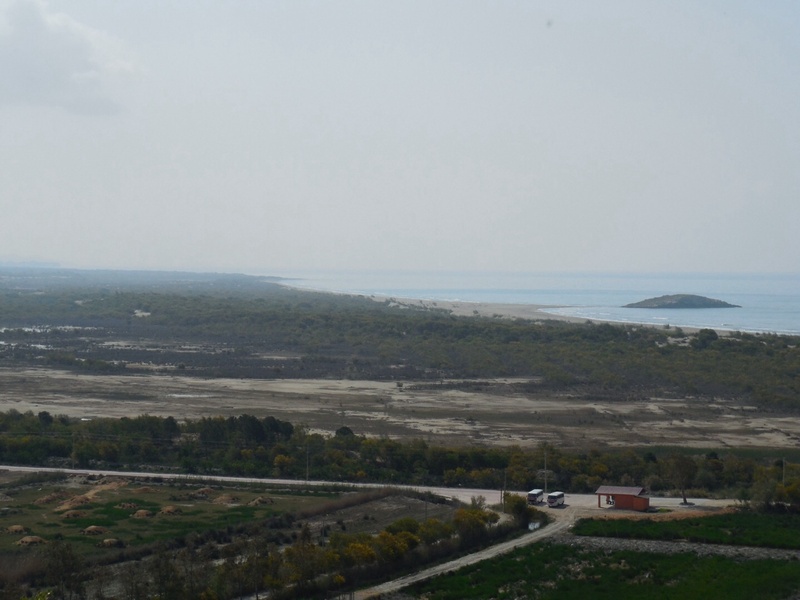 Originally a small military and naval base that guarded the extreme Western end of Patara beach where the Ozlen river flows into the Mediterranean. 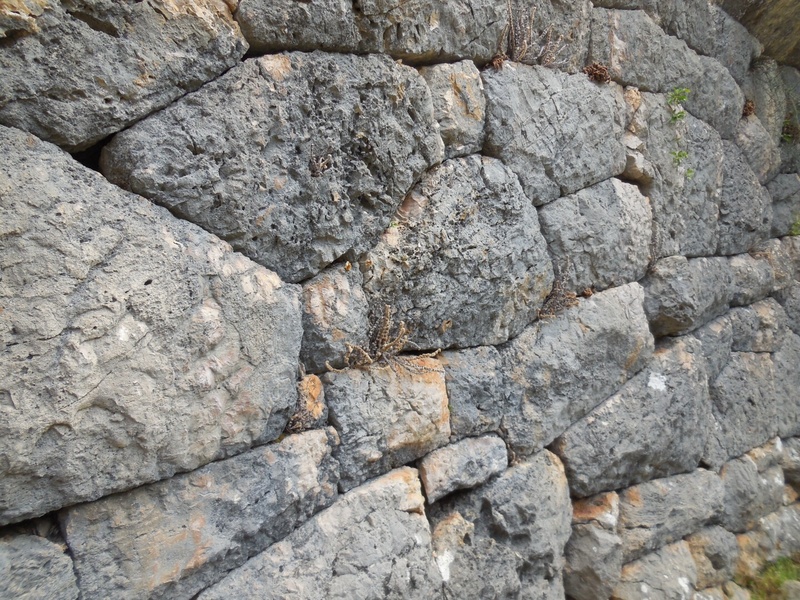 Walls of polygonal masonry smoothed at each edge ensuring each block meets the next in a concavity allowing no grips for climbing the exterior. Today only the incredible walls are left mostly intact, inside the walls any buildings that may have once stood are now stones distributed all about the broad overgrown enclosure. Howard and Judy have made their way through the low hole in the wall ten minutes or so before us and Howard helps me lift my heavy pack through from my uncomfortable squatting position midway. Pam follows more easily, she is much better with the ‘get down low and go, go, go’ stuff than I. Inside the walls are painted indications to replace the brush wood stacked over the entrance to prevent rural animals entering the walled enclosure and no sooner have I rearranged the branches than a woman calls through from the other side ‘are we not to enter’? When I pull aside the branches an extremely fit looking German woman waddles through with her backpack still on in a display of strength that has my knees crying out on her behalf. 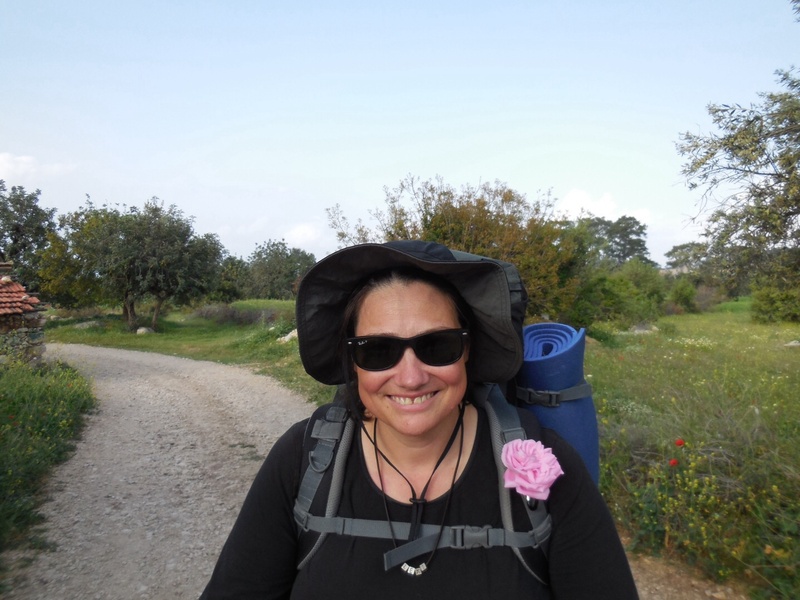 She is wearing a marathon participation shirt and looks ready to run the rest of the Lycian backpack and all. After a short burst of high energy conversation she is ready to forge onwards, however has trouble finding markers. 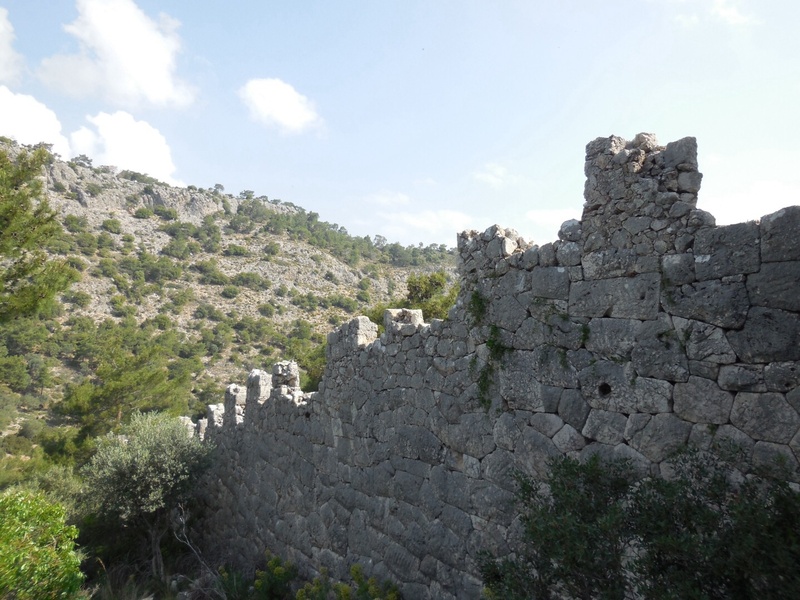 Spying a Lycian red cross she relays her concern in a manner that we are to repeat often ‘it is FORBIDDEN’. Howard and Judy are much more low key. Howard and I climb the walls via stairs built into the structure on the inside. Looking up the hill the wall seems mostly unbroken and stretches all the way to the hilltop. Passing back through the knee crushing arch Howard and I set off in search up the hill. Howard is surprisingly agile and leaves me gasping in his wake, pointing out photo opportunities as we climb. 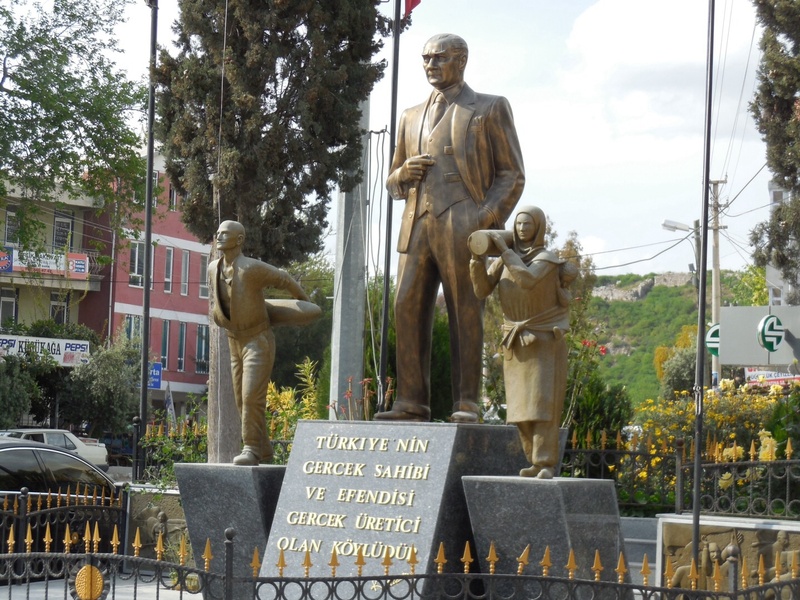 From the hilltop we can see two Dolmus waiting at a bus shelter. Howard and Judy are definitely catching one through the vast valley of the tomato tents. Pam is still trying to convince me to walk the whole way. As we descend Pam and Judy are climbing up, Howard has not taken their camera. Setting out as a group Howard and Judy steadily move ahead as I stop frequently for shots of the surrounds. By the time we have made the far side exit hole through the walls they are almost out of sight. 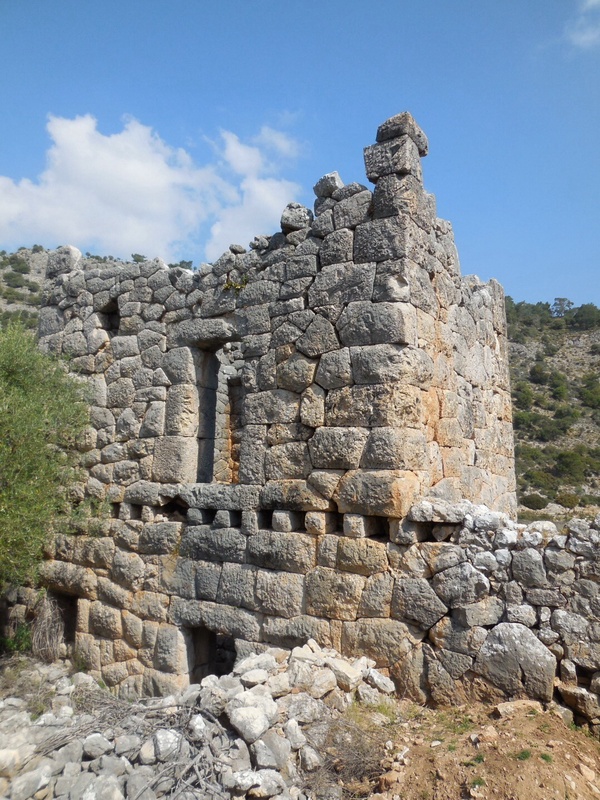 Both the interior of the ruined walls and the exterior surrounds are full of large stones and the terrain is rough. We are ever cautious and slow as we climb the hill and descend once more. Slow and steady wins the race, or at least this leg of it. Howard and Judy have lost the way and plaintively call out from the reedy creek edge below, ‘are you following the markers’? 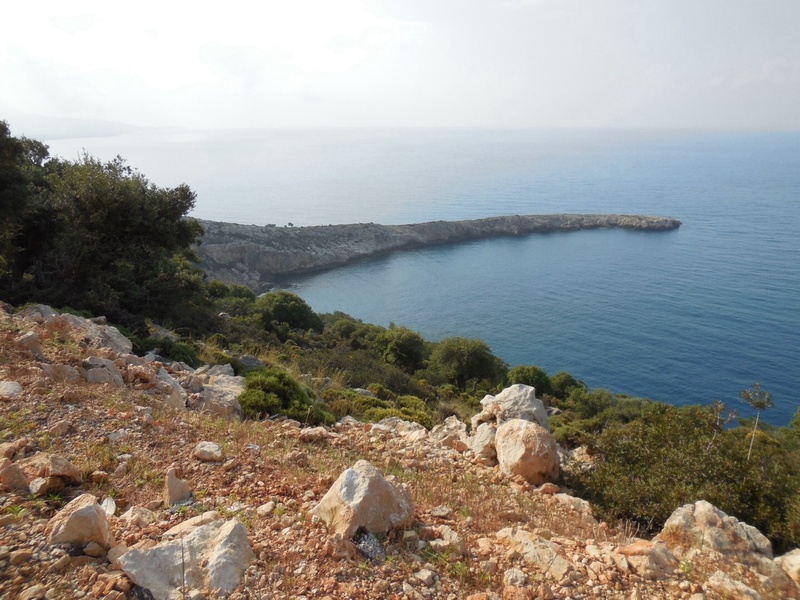 Pam and I clamber up the steep rough shoulder and commence our walk down towards the blue, blue sea. 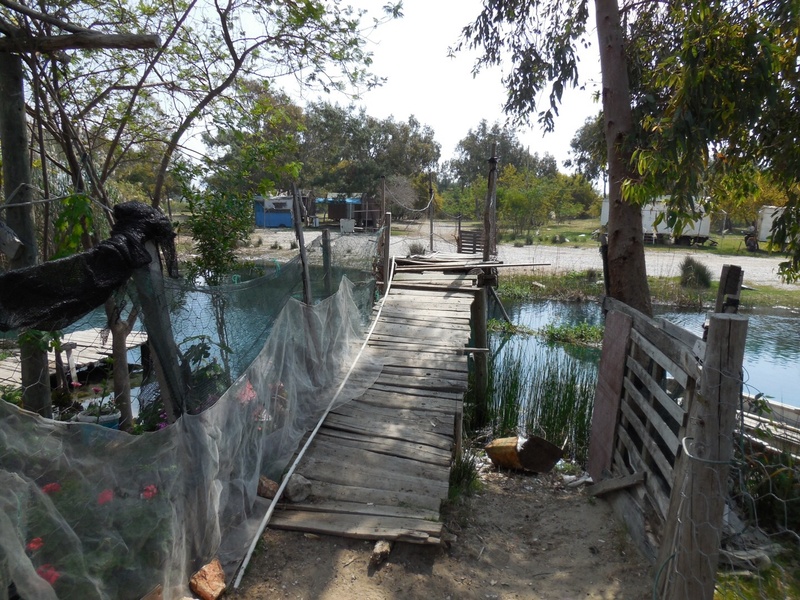 At the base of the hill we are forced to turn left at the creek (Olzen River) that flows into the sea and make our way towards some rustic dwellings where an extremely rickety looking bridge offers the sole means of crossing. Pam looks at me, I know what she is thinking, ‘let the large lad test this flimsy structure, if he can make it then I am good to go’. Keeping my feet directly over the largest and most solid looking beam I sally forth. The bridge creaks, rocks side to side, groans a few times but lets me pass dry. By the time Pam has crossed Howard and Judy have caught us up and I take photos of all three of them crossing. By now I am tired, the day is hot, the prospect of walking unendingly through an industrial poly tunnel nightmare is abhorrent to me. Pam must have sensed the storm brewing behind my brow as I look at the long road ahead of the bus shelter and sensibly recants her intent of walking the whole way. As we drive on through the flapping labyrinth we pass the young Russian couple sweating it out doggedly on the brick cobblestone road. ‘Good call’ says Pam to which I reply ‘can you imagine the incessant litany of whining and whinging you would have had to endure if you made me walk through this flat roasting poly tunnel hell’. Alighting from the dolmus at the road junction to the Letoon ruins the four of us spend some time looking through a general store in search of food yet find nothing of interest. Setting off down the road towards the ruins Howard and Judy soon leave us in their wake. John, Peter and the two young American men we ran into near the beach the previous night are returning back towards the bus sans backpacks. They have left their packs at the store, wish we had thought of that. By the time we have arrived at the ruins site and dropped our packs off at the ticket office Howard and Judy are strolling through the ruins. Pam and I take a rest on a bench under the shade of a tree where I eat our last orange and Pam sees a snake sliding out of sight then head out into the majesty of the strewn blocks, temple ruins and amphitheater. Reading the signage at the entrance I realise that I know this story. Late in primary school I was fascinated by stories of Greek, Roman and Norse mythology and read many books on these subjects. Many years have passed since last I read this particular violent tale of lust, infidelity and revenge yet still it is locked up deep in the vaults of my subconscious. 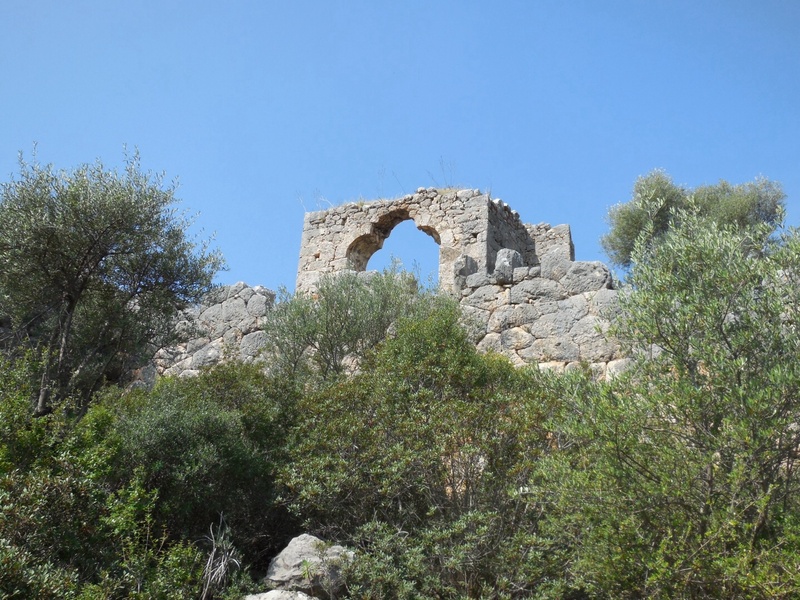 Letoon was the holy sanctuary of the goddess Leto and her two children Apollo (God of Archery, Musicianship and Healing) and Artemis (Goddess of the Moon and Wild Creatures). In Greek mythology Leto was a daughter of the Titans and the lover of Zeus. Impregnated and abandoned by her lover she gave birth to twins on the island of Delos in the Aegean only to be pursued by his vengeful jealous wife Hera. Leto and her children fled wandering in search of safety and succour stopping out of thirst to drink from the springs at Letoon. Shepherds attempting to chase Leto and her mighty offspring from the area were rapidly turned into frogs. 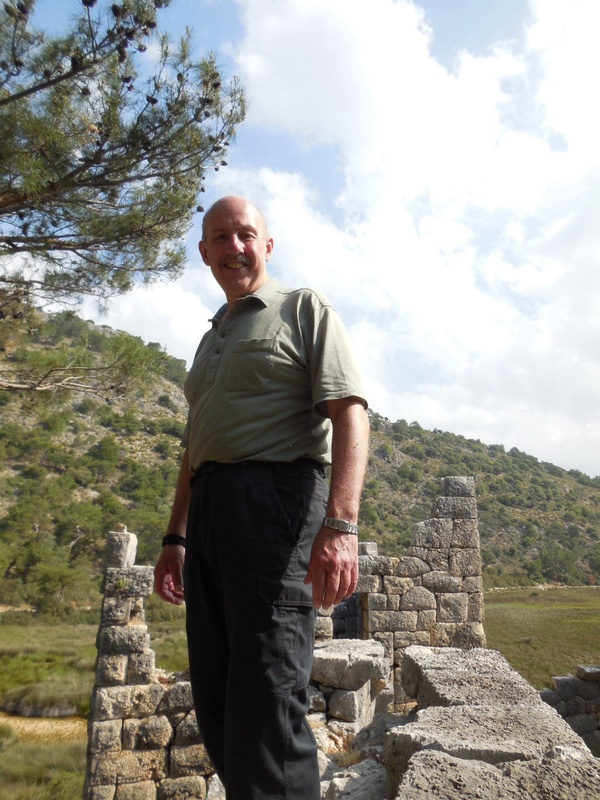 The Letoon Temples were erected on this valuable spring water site and were an important site of pilgrimage. 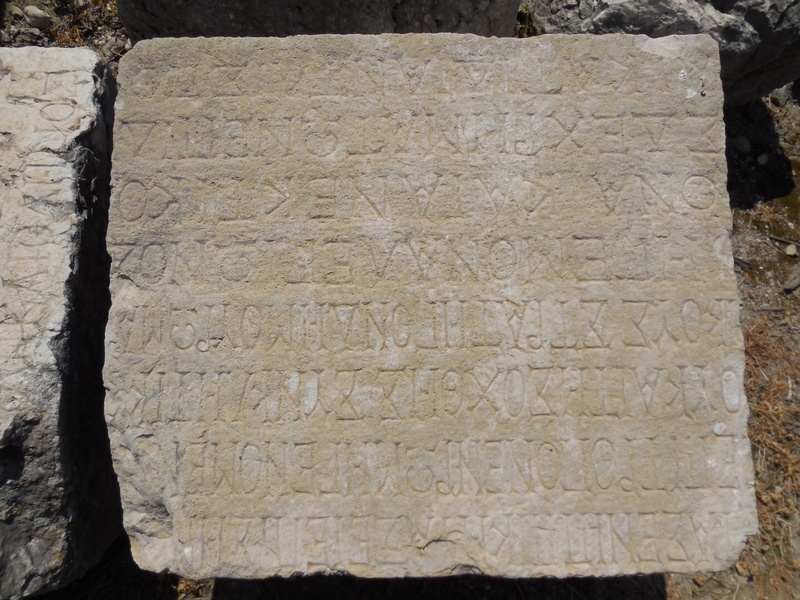 An inscription recording a visit by Alexander the Great was found in the ruins. 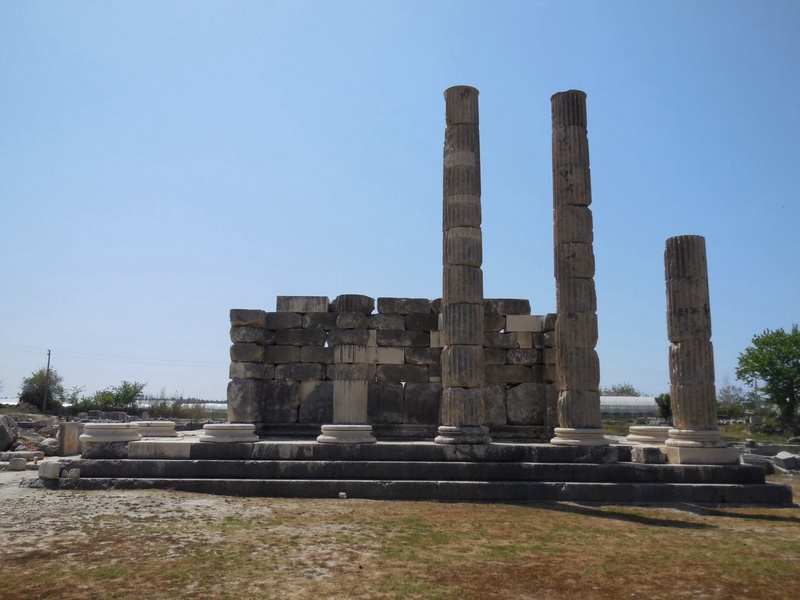 Today four major areas still stand as excavated ruins, the large surprisingly intact amphitheater, and three temples, one each devoted to Leto, Apollo and Artemis. 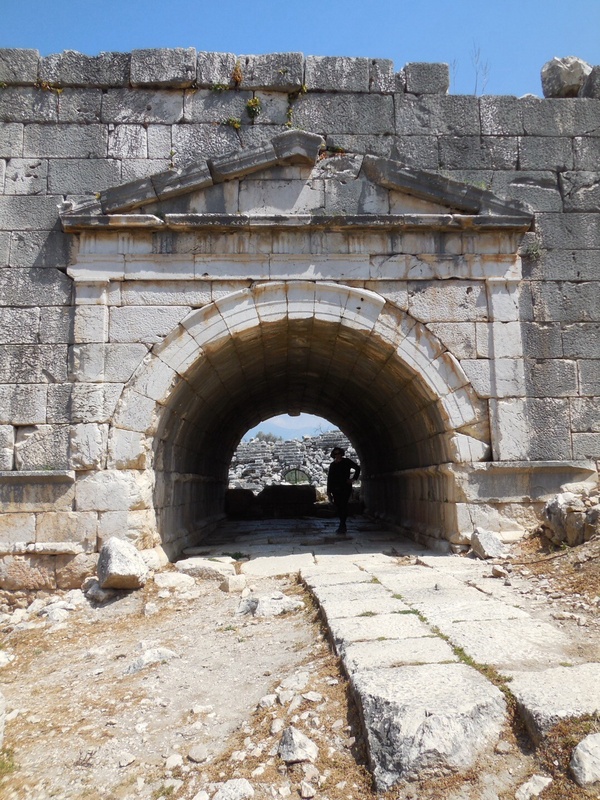 Deciding to start with the amphitheater we walk past rows of hundreds of archeologically numbered excavated blocks, up a slight rise, turn left and walk through one of the entrance arches. 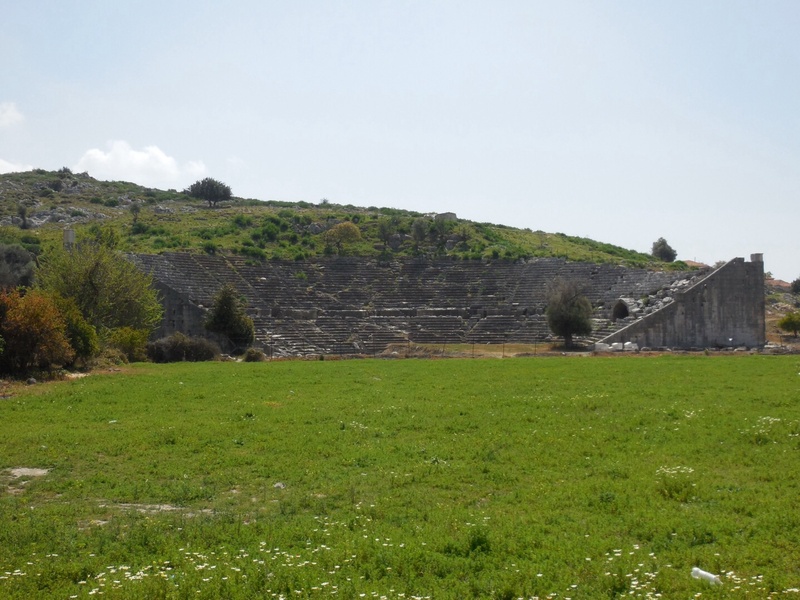 The stands of semicircular seats have been carved into the bedrock of the hillside in the Greek style. There is no surviving stage structure at the base. From here we wander back through the rows of blocks and walk around the ruins of the temples devoted to Leto and Artemis. 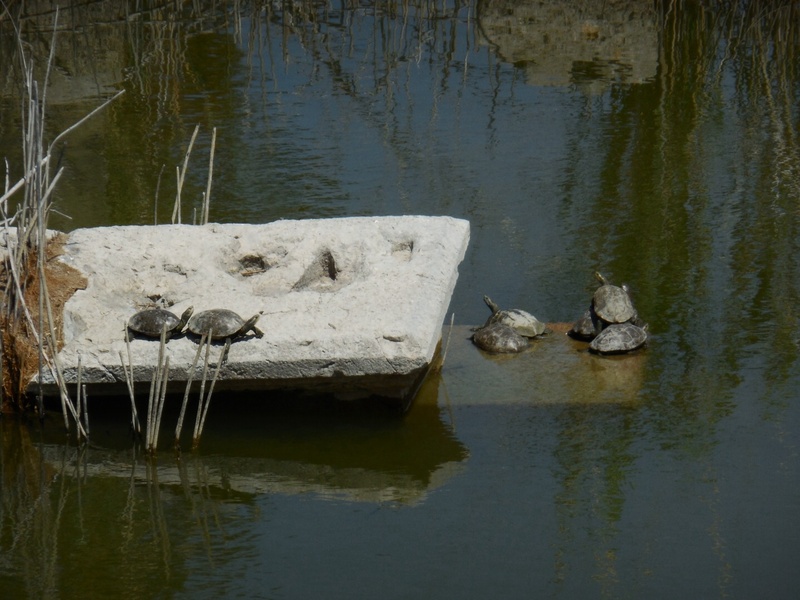 Tortoises sleep warming one atop each other on stones standing amidst the notorious spring waters. 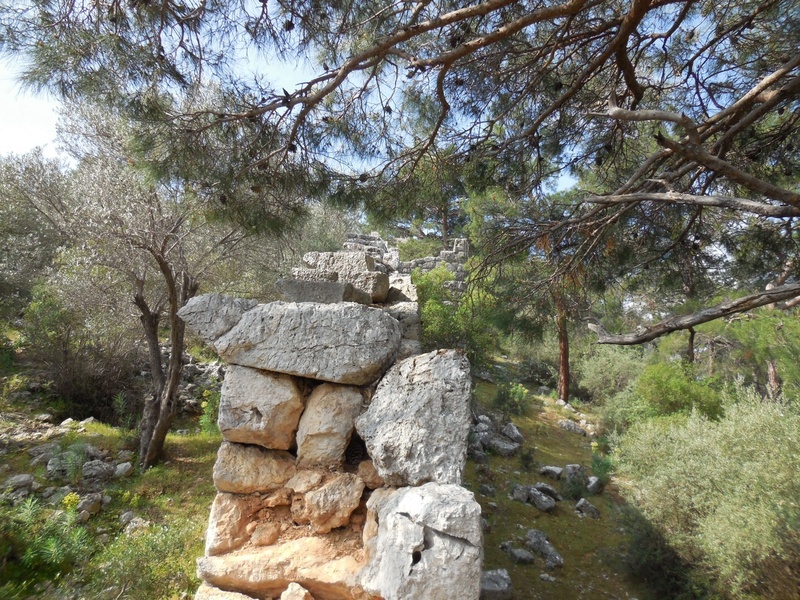 Finally we head towards the ruins of the temple of Apollo that lies near the base of the encircling hillside. 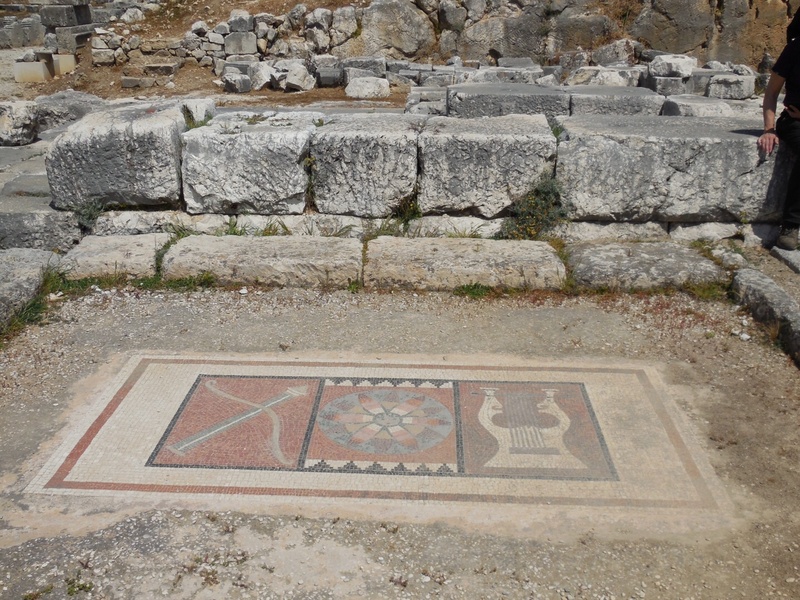 Howard calls out to ask if we have seen the mosaic on the floor of the ruined temple devoted to the God Apollo and we climb the stones to join he and Judy. Watching me take photos reminds Judy that they have not done so themselves and she hands Howard their camera. Howard’s attention is dispersed, he has been talking to me, fiddling with the camera, he takes an unfocused step and his heel catches the edge of the stone block on which he stands. Stumbling down his right leg hyperextends awkwardly, he attempts to rein in his stumble and takes a couple of jerky steps before crashing down on his right shoulder and rolling to his back. As we all rush to his aid he is lying very still with his eyes closed and remains quiet for some time. When I go to assist him up he says ‘I think I am hurt’ and responds to our questions as to his injury ‘I may have sprained my ankle, I can feel it swelling in my boot’. Eventually we are able to help him sit up. Judy who was a qualified physiotherapist runs him through a few ankle mobility procedures and determines that his ankle is ok however he is still in obvious pain and is turning white and faint. After a while he starts to feel a little better however his mobility is severely compromised. I shorten my Pacerpoles to a length more suitable for him to use as hand held crutches and we slowly set off towards the ticket office. The director of the ruins site has seen we are in trouble and drives his car up into the site, turns around and offers Howard and Judy a lift to the bus stop which they gratefully accept. Pam and I help Judy load their packs into the car and bid Howard a swift recovery before they drive away. 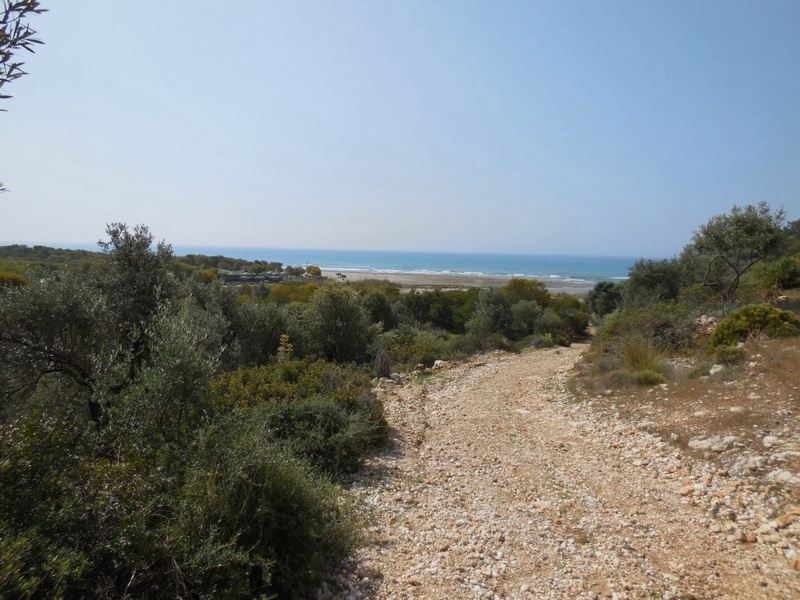 Our own confidence has taken a bit of a battering and we are quite solemn as we trudge back up the hot street towards the main road where we turn right and begin walking towards Kumlouva. The day is becoming quite hot and storm clouds appear to be banking up over the hills when I call a pit stop at a roadside barbecue cafe. Pam is not hungry though I am starving. The cafe owner takes me to the butcher next door and recommends I try the Chicken Butterflies which is a cut that I have never heard of. 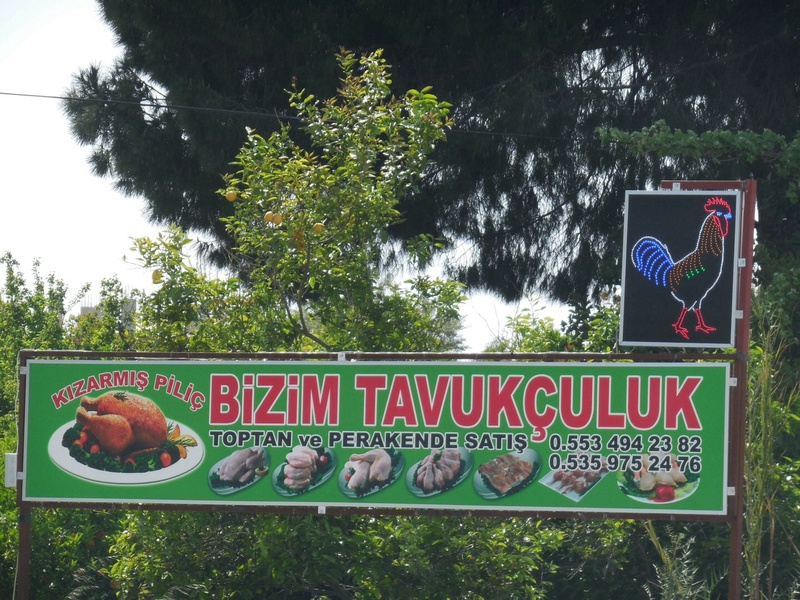 As the chicken pieces cook slowly on the outdoors grill we watch Turkish life go by. Scooters are the favoured means of transport. Dad and Mum astride the seat with two kids standing in the footwell ride by all on one. Nearby schools are pouring students out the gates, Dad rides up the street to pick up his ten year old son who is driving the scooter as they return. A hundred or more two stroke variations on this theme keep us well entertained as I wait for the meal to finish cooking. Finally my ‘butterflies’ are done. 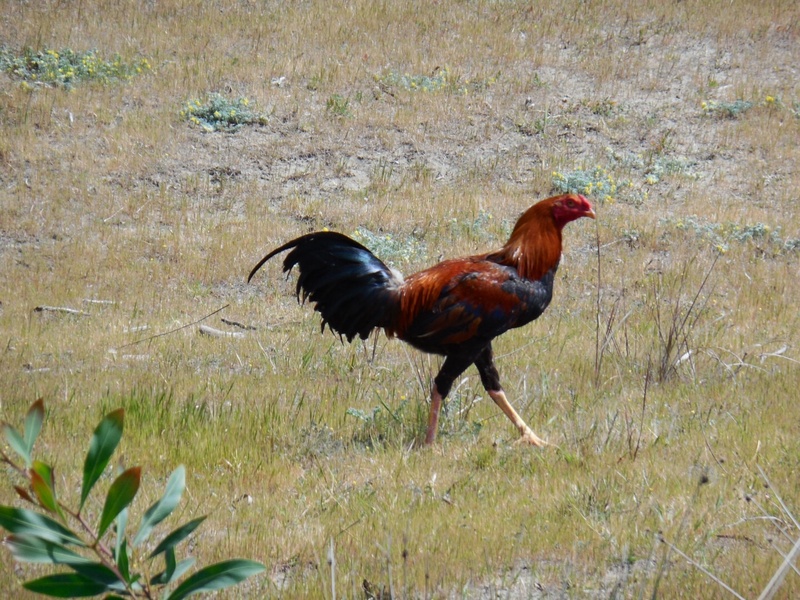 Turns out a chicken butterfly is the meat off the chook’s back between the wings, mostly bone and fatty skin. I wolf down the tasty treats which are the first meat dish I have eaten in ages. My vegetarian wife looks on in resigned horror as I slurp away at my greasy fingertips. Satiated at last I am willing to consider further hot roads to come. Passing the roundabout in the centre of Kumlouva we catch up with the marathon running German lady who had lost the markers and walked a long way round the poly tunnel valley. 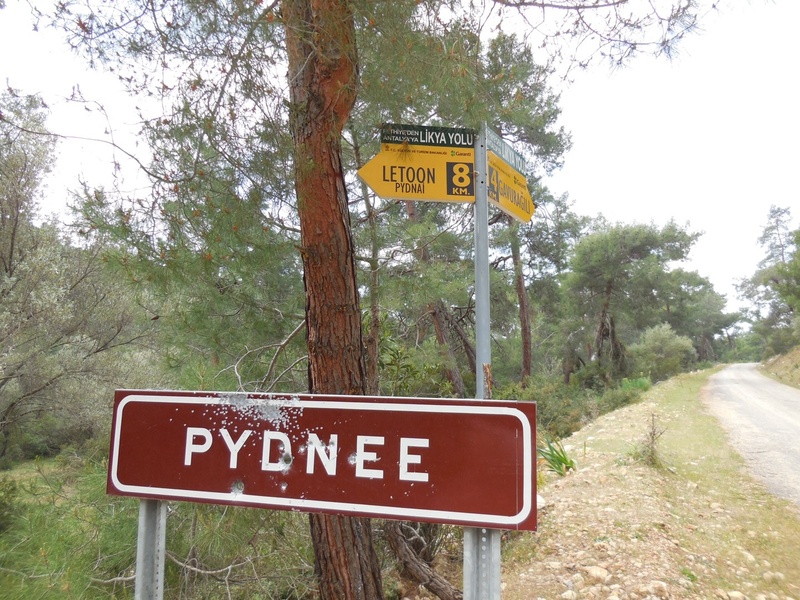 Road signs never seem to match up with each other on the Lycian. 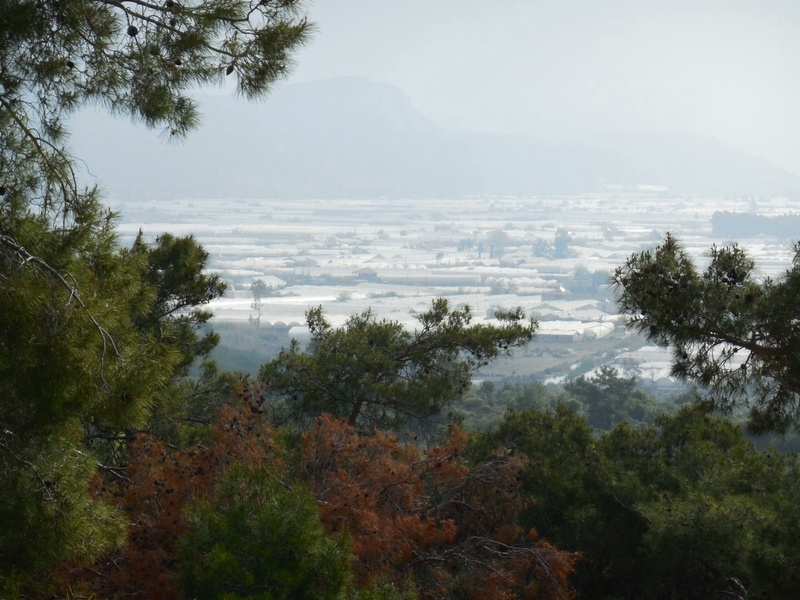 As we turn left and begin marching up the busy bitumen road towards Xanthos and Kinik beyond, the indication is that we have to walk three kilometers. By the time we arrive at the next road sign it indicates the return is four kilometers. Either way it is too far to walk on a heavily trafficked narrow bitumen road. Pam has a near inexhaustible ability to cast dubious nicknames for every odd occurrence or happenstance so I am both a little surprised and guilty on Howard’s behalf as during our exhaust fumed march I come up with the term Howie Owie as a name for ‘an unfortunate event resulting from a momentary lapse in concentration that we should strive to avoid at all costs’. As we turn right to cross the bridge spanning the swift flowing Esen river towards Kinik the German lady catches us. Finally we all introduce each other. 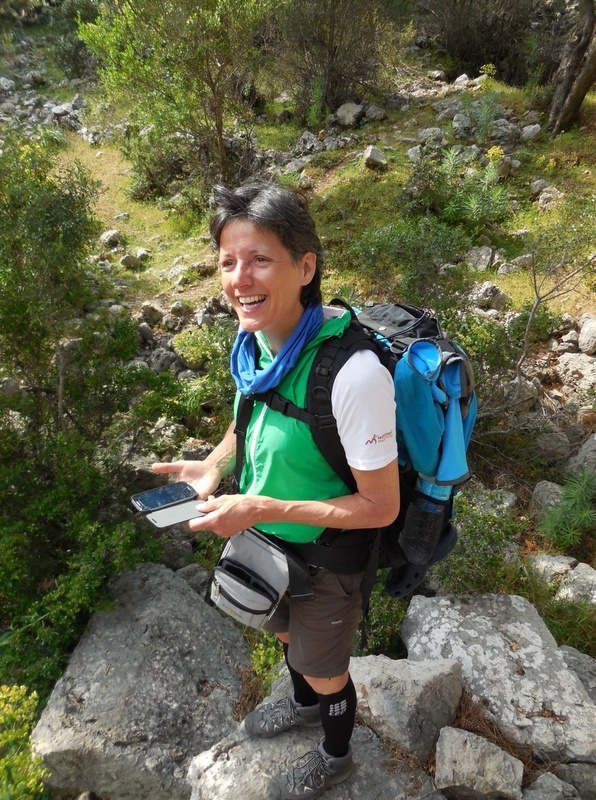 Our energetic friend is called Annette and has run two marathons however no longer runs long distance due to knee issues. 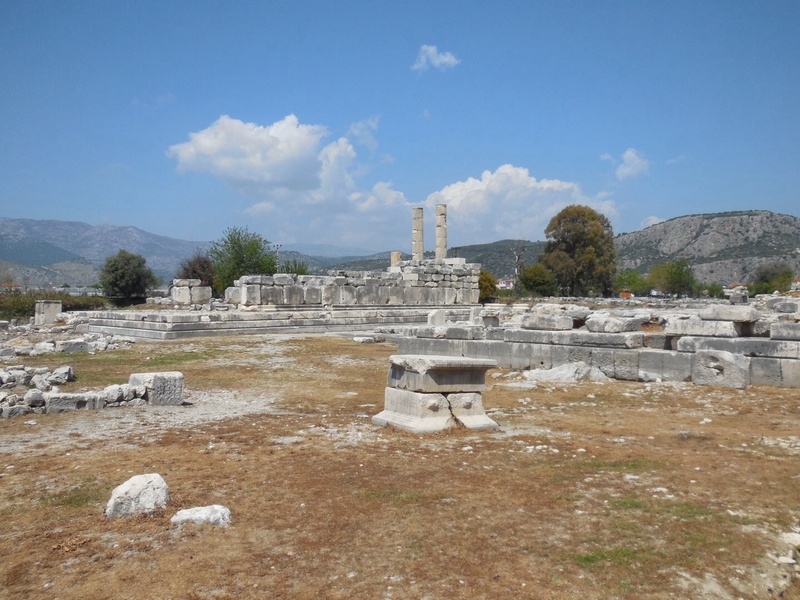 She is planning to seek accommodation in Kinik as are we and explore the Xanthos ruins from there before walking on. As she walks ahead of us she says that she will see us down the trail however due to the disparity between our walking paces I feel this is most unlikely. Kinik is a busy rural town with many cafes all populated by men playing a local dominoes like game Okey which I do not understand. We are unable to find any accommodation and end up sitting outside one of the cafes ourselves drinking coffee and Cay whilst we consider our next move. 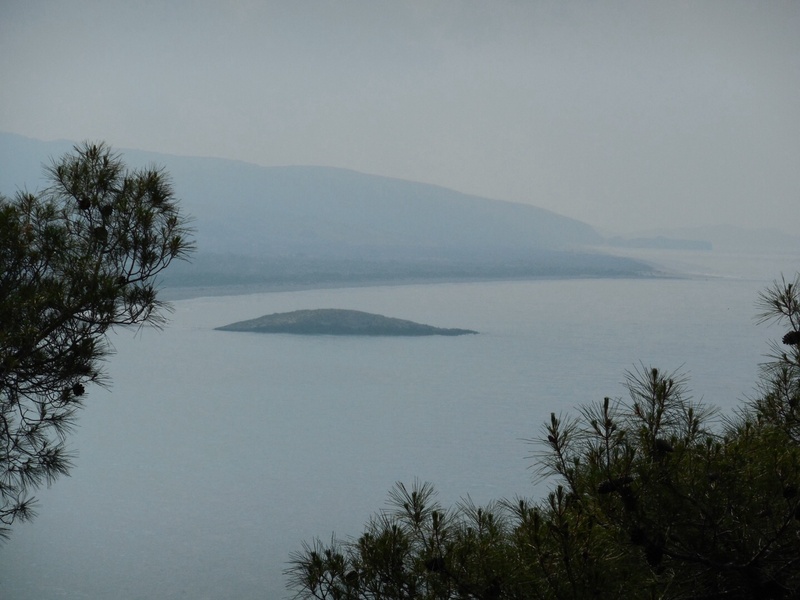 With the sun starting to head low eventually we decide we will catch a dolmus to the more major tourist town Kalkan and return the next day to explore the Xanthos ruins. Annette has had similar problems to ourselves and we find her waiting for the same bus. The bus has WiFi and Pam busily researches hotel options whilst for me the ride passes in a tired blur. 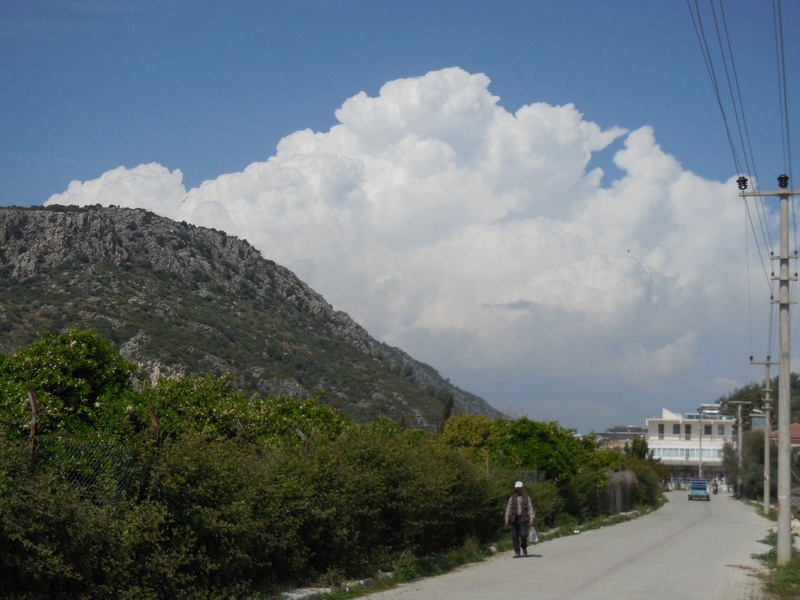 Half an hour or so later we are climbing stiff kneed down to the Kalkan bus station parking lot. Zinbad Hotel is down, down, down the long, steep, interlaced brick cobblestone streets of Kalkan and is located near the mosque close to the waterline of the picturesque harbour. By the time we have arrived and tumbled into the reception like two sweaty panting grumpy beasts all we want to do is shower and rest. It has been a long hard day. Luckily the Zinbad Hotel has great showers with ample hot water, half an hour or so later we are capable of grinning at each other once more. After we have a lovely dinner in the terrace restaurant atop the hotel we receive an email from Howard and Judy. Howard’s ankle is fine however he appears to have torn or partially torn his calf muscle. He and Judy are going to take a few rest days in Kalkan and vary their plans according to his recovery prognosis. A slow dark fluid abyss of dreams inserts another broad wedge between concentrated temporal units.